Training camp is getting to Cleveland Browns coach Pat Shurmur. From integrating rookie quarterback Brandon Weeden into the offense, to dealing with injuries to seemingly half the defense, the possible suspension of cornerback Joe Haden, and chasing Eric “10-win” Mangini on the franchise’s career wins list, the stress and pressure seems to be getting to the second-year coach. 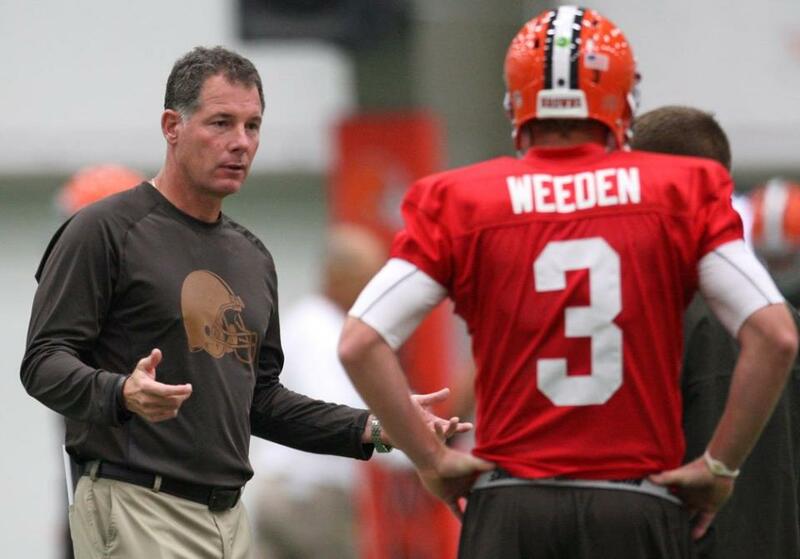 How else to explain Shurmur’s reaction earlier this week to Twitter? After Mohamed Massaquoi left Friday’s preseason game against Detroit with what was reported as a concussion, the fourth-year wide receiver Tweeted that he was fine, no concussion. When questioned about it by the media, Shurmur took off on Twitter. “You know how I feel about tweets and twitters number one,” Shurmur said. “I told you what happened and that’s what happened so I don’t know. I only hear what gets tweeted, but he had a concussion and we’re treating it as so. “I don’t like (tweets), that’s my policy. I encourage (the players) not to (tweet) and I think it’s important that they don’t. I don’t think you can totally harness social media. I’ve come to that realization, but what I can do is encourage and inspire them to be very professional and not talk about Browns business. That’s just my feeling on it. That’s a big thing to harness, social media. The thing is, all Shurmur had to do was say the Browns were correctly following league policy in dealing with head injuries and that should have been the end of it. It is irrelevant if the player doesn’t think he has a head injury, that’s why the league changed the rules. They don’t want players making the decision to return to the game if they are injured – especially a player like Massaquoi, who has suffered at least two concussions in the past two seasons. As for Massaquoi, he seems to understand what happened. Massaquoi also volunteered to give Shurmur a lesson in the finer arts of Twitter. All kidding aside, Massaquoi needs to focus more on his game as the preseason continues. For all the talk about how the Browns are going to limit Josh Cribbs role as a wide receiver this season, the converted quarterback still caught 41 passes for 518 yards and four touchdowns last season. Massaquoi has never had more than 36 catches or more than three touchdown catches in his career. If MoMass can’t step up his game in the coming weeks, he may have more time than he wants to spend on Twitter.